I have made friends from all over the world, and this has provided me with a global perspective, and built my own identity. I do believe all journeys and experiences in life truly affect my ideas, development, and creativity. Fumi also went on a semester abroad to Tomas Bata University of Zlín in Czech Republic, and won the Chartered Society of Designers’ CEP Student Prize for Decorative Arts 2017. 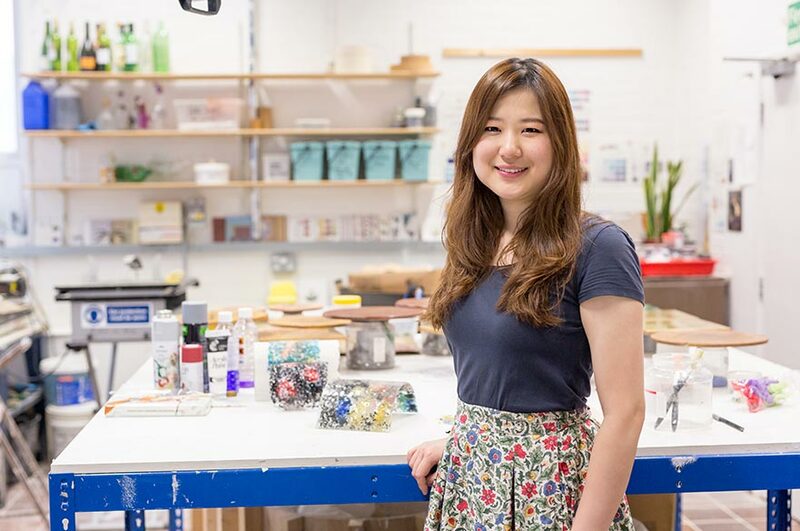 “The diversity of activities available - we tried different things in our first year, including material experiments with ceramics, wood, textiles, resin, metal, and glass. Staying motivated was not difficult. I had a keen interest in what I was learning, as each module challenged me to learn something new and different. What did you enjoy most during your exchange to Tomas Bata University of Zlín and what did you learn? “I went to the Czech Republic to study glass design and animation on the Erasmus+ programme for six months. I also studied calligraphy, contemporary visual culture, model making, design history, life drawing, and Czech while I was there. “I had an amazing time, and if I had to choose what I enjoyed most, it would probably be my first exhibition in Madrid, Spain. The glass department in Tomas Bata University had the opportunity to hold their exhibition in Spain while I was there, and they selected me to represent their course. How did you find out about the exchange programme? Would you encourage other NTU students to go on exchange? “Yes, because you can experience cultural differences and a new way of learning. Visiting new places and meeting people from different backgrounds has opened my eyes and changed my life in many ways. I was originally from Japan, however I lived in China for several years before I came to England, and then I went on exchange to the Czech Republic. “I did a few different work placements while at University, including an internship at the Saatchi Gallery in London. I was also a Ceramic Instructor in Tokyo, a Manager for Artist Residence in London, a Design Assistant at Wild Rumpus in Nottingham, and I also did an internship in illustration at Debbie Bryan in Nottingham.